The Anthracite Region of Pennsylvania offers the visitor a wealth of enlightening and entertaining history. Start your journey at Pioneer Tunnel with an intimate introduction to the natural resource that fired the Industrial Revolution. Necho Allen’s campfire, which ignited a hard coal outcropping not far from Ashland, blazed a whole new way of life for central Pennsylvania. By 1828 bustling coal towns filled with opportunists, adventures and fortune hunters were rising overnight. Prospectors scarred the mountains with pits and trial shafts. When these filled with water at 30 to 40 feet, they’d dig others. Soon, operators discovered that they could dig much farther by tunneling straight into the mountain from a ravine or the foot of a hill: horizontal mining.The original Pioneer Colliery was operated in Mahanoy Mountain at Ashland in the late 19th century and gave its name to the Pioneer Tunnel, which was owned and operated by the Philadelphia and Reading Coal and Iron Company from 1911 to 1931. It echoed the grunts of gritty-faced miners, the crunch of pick against coal, the screech of overloaded iron wheels. Water dripped from the dank, heavy timbering overhead to mix with the sweat of straining mules. Oil torches, and later, carbide lamps flickered in the darkness, pointing bright fingers at the glistening rock. And when the day was over, scores of tired, dirty eyes came out and squinted in the fading light. 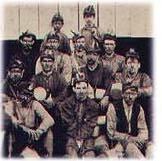 Electricity sparked the Anthracite industry to its peak and greatly improved the miner’s lot in life. Electric mine motors pulled the ore cars and huge motors pumped away the water. Brilliant lights brought day to the dark. A trip through Pioneer Tunnel today brings back some of the early miner’s lore – his way of life. You’ll ride 1800 feet into Mahanoy Mountain darkness on a mine motor to see glistening seams of coal as he did; feel the drops of water falling on your brow. A miner guide will tell you how early miners worked, how they erected heavy timbering, how they got out the coal. Later, you’ll emerge from the darkness, having seeing history unfold in front of your eyes. And there is more . . . All Aboooard!…Chug chug…whheeee! With the rattle of brightly painted cars, a blast of steam and belching black smoke, the Henry Clay heads around the mountain just as its predecessor did 50 years ago. At that time digging was just beginning on one of the engineering wonders of its day: the Mammoth Stripping. Behind Mahanoy Mountain an unusually thick seam of coal call Mammoth Vein bent up to the surface of the earth. Monstrous steam shovels of the Panama Canal type were moved in to mine it. They rumble over the coal bed on giant railroad wheel assemblies, their iron teeth ripping huge mouthfuls of black rock to send crashing into strings of empty cars. Where the shovels went, they left a 250 foot high wall of solid rock extending as far westward as the eye can see. Millions of tons of coal were pulled out by the narrow gauge predecessors of the Henry Clay…a lot of it on the same trackbed. These powerful little 0-4-0 type steam lokies were only 23 feet long, 8 feet wide, 12 feet at the top of the stack and equipped with 33 inch drivers, well-sized for their duties in the strip mines. Today the Henry Clay is one of the last of this breed in existence. As you are hauled up the mountain in an unsprung, rebuilt coal car, history unfolds on all sides. The pits and mounds are everywhere, in some places looking like landscape from another world. There are tow stops where you can look down into the gaping trenches man has left and almost hear the rumbling shovels, clanking chains and crashing coal of yesteryear. And you’ll get a bird’s-eye-view of a typical coal town with its wooden row houses, tall-spired churches, and more, in Ashland, Pennsylvania.